If you see this dog coming for you, run. Thanks to his extensive training--and customized body armor that can cost upwards of $30,000--he's bulletproof, can hear through concrete, and can record high-def video of missions, even in the dead of night. 149diggsdigg Since the moment it was revealed that the "nation's most courageous dog" [Update: named "Cairo"] served alongside the 80 Navy SEALs who took out Osama bin Laden, America's fascination with war dogs has hit a fevered pitch. And while the heart-tugging photos of these four-legged heroes are worth a look, so is the high-tech gear that helps them do their job. 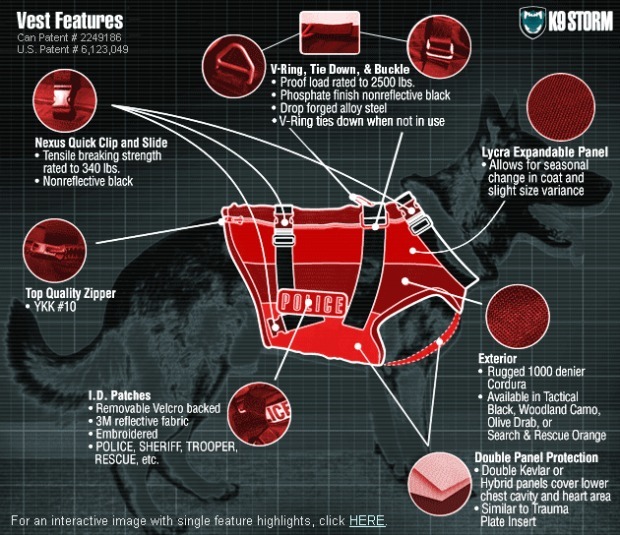 Last year, the military spent $86,000 on four tactical vests to outfit Navy Seal dogs. The SEALs hired Winnipeg, Canada-based contractor K9 Storm to gear up their four-legged, canine partners, which it has used in battle since World War I. K9 Storm’s flagship product is the $20,000-$30,000 Intruder, an upgradeable version of their doggie armor (you can check out the full catalogue here). The tactical body armor is wired with a collapsible video arm, two-way audio, and other attachable gadgets. "Various special ops units use the vest, including those in current headlines," says Mike Herstik, a consultant with International K-9, who has trained dogs from Israeli bomb-sniffing units to the Navy SEALSs. "It is much more than just body armor." The big idea behind the armor add-ons boils down to a simple one: the key to any healthy relationship is communication. Each dog is assigned one human handler. To operate efficiently in a tactical situation, they need to be connected. So how much high-tech connectivity does a dog get for $30,000 anyway? Using a high-def camera mounted on the dog's back, handlers can see what the dog sees, using handheld monitors. Jim Slater, who cofounded K9 Storm with his wife Glori, says footage is stable because the entire module is sewn into the vest. With unpredictable light conditions, like middle-of-the-night missions, the camera adjusts automatically to night vision. The lens is protected by impact-resistant shielding. And since we're talking about SEALs notorious for amphibious assaults, the system is waterproof. In Abbottabad, the patented load-bearing harness would have enabled a Navy SEAL handler to rappel from the helicopter with his dog strapped to his body. Once in the compound, the dog could run ahead to scout as the handler issued commands through an integrated microphone and speaker in the armor. The proprietary speaker system enables handlers to relay commands at low levels to the dog. "Handlers need to see and hear how their dog is responding," said Slater. "In a tactical situation, every second counts." The encrypted signal from dog to handler penetrates fortified barriers like concrete, steel-fortified ships, and tunnels. That translates to standard operating ranges up to four football fields. The armor itself protects against shots from 9mm and .45 magnum handguns. Slater is a veteran police dog trainer and built the first vest after a prison riot. He realized he wore full riot gear, while his K9 partner, Olaf, was basically naked. So he started making vests. The weave technology catches bullets or ice picks like a mitt wrapping around a baseball; knives and sharpened screw drivers wielded by prisoners require tighter weaves. Keeping the armor strong, but light, is a priority. "Every gram counts for our clients. So we prefer advanced fibers and innovative textiles," said Slater. "The entire communication module is 20 ounces." The average armor weighs between three to seven pounds, depending on the size of the dog and the level of protection. They’ve even gone stealth. A silent hardware system prevents any metal to metal contact--you won't hear any jangling or see any reflective give-aways. K9 took the average 150-gram V-ring and developed a 5-gram version made of a Kevlar, poly-propylene, and nylon fiber blend. "It’s actually stronger, rated to 2,500 pounds. Completely silent, and ultralight," said Slater. Of course, these systems don't come cheap--and it's the dogs themselves that are the real investment. The Navy’s first Master Military Working Dog Trainer (a trainer of other dog trainers), Luis Reyes emailed from Afghanistan: "There are many products that help MWDs [military work dogs] and many are ‘cool’ but not necessary. No amount of money can replace the life of a canine that saves the precious lives of our troops in harm's way." Although new tech is the buzz, what put K9 Storm on the map is dedication to customization. Its mainstay dog armor is the more-affordable $2,000-$3,000 base model. Each vest they make is custom sized for the dog. "The fit has to be perfect or it will flop around," said Slater. That hinders mobility, or worse, can cause injury. Clients can measure dogs themselves, or Slater will fly out for dog fittings. They’ve done 15-pound West Highland Terriers--which look like playful white puffballs but were bred to scare badgers out of holes, and are helpful in drug raids with confined spaces like air ducts. On the other end are St. Bernards, which push 240 pounds. K9's client list spans 15 countries, from China to Switzerland. Buyers include SWAT teams, police and corrections agencies, security firms, search and rescue units, and border patrols. Slater and 12 employees spent years developing a proprietary computer-assisted design program to translate measurements into accurate patterns, which are hand sewn. However, it's as much a tech company as it is an armor manufacturer. The next phase of development includes plans for remote-delivery systems and enhanced accessory functionality. They describe a system that would help dogs transport medical supplies, walkie-talkies, or water into constricted areas like rubble. They're also planning new appendages like air-level quality meters for mines. No word on mounting mini heat-seeking missiles just yet. So, for now, bad guys will only have to tussle with highly-trained fangs exerting 700 pounds of pressure per square inch.